The name Gallo may invoke a vast enterprise that produces a raft of wines under a great many labels. But the company also has another side, one more suggestive of a boutique operation, that offers a robust, complex Cabernet Sauvignon bearing the imprimatur of winemaker Gina Gallo. Indeed, the medium-priced 2012 Gallo Signature Series Cabernet Sauvignon ($36) stands comparison not only with more costly wines from California’s Napa Valley, the source of its grapes from Gallo’s own vineyards; in terms of quality-for-price, it also offers an appealing option to more expensive wines of Bordeaux. Striking for its dark red hue, the 2012 Signature Cabernet Sauvignon — literally signed by Gina Gallo — is even more alluring in its aromas of blackberries and black plums with traces of tar and mint. Those same scents become flavors on the palate, joined in the background by tobacco and sweet earth. In other words, it’s an opulent wine with the weight implied as well as the acid structure required for longevity. 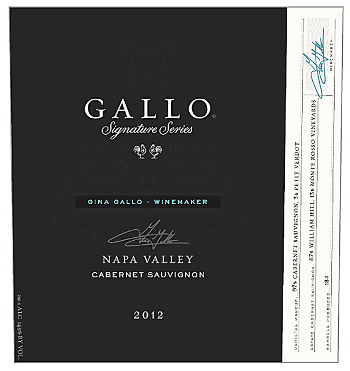 Even in its fledgling youth, Gallo’s 2012 Cabernet Sauvignon holds immediate appeal, thanks in part to smooth, ripe tannins. No doubt an infusion of Petit Verdot – the winemaker doesn’t indicate how much – also contributes to both the vibrancy of the wine and a flavor profile that keeps pulling you back. It’s a mouth-filling wine with a long finish: a great pleasure. Louis Latour Corton-Charlemagne 2011: Just to the north of the Burgundian city of Beaune lies one of the preeminent landmarks of French viticulture – the Hill of Corton, locus of several grand cru red Burgundy wines and of Corton-Charlemagne, the only white grand cru that’s not part of the Montrachet cluster around Puligny-Montrachet farther south. Grand in every sense, Corton-Charlemagne provides a constant reminder of what sets the greatest of Burgundian Chardonnay apart from any other expression of that grape in the world. The 2011 Louis Latour Corton-Charlemagne ($99) is an impressive example of a majestic wine rooted in the limestone-rich soil on the Corton slope. Indeed, even at the price, it’s a comparative bargain in the scheme of white Burgundy grand cru, which can run well above $200 a bottle. 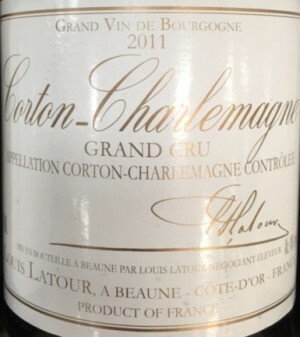 Latour’s 2011 Corton-Charlemagne possesses the petrol-like texture and buttery, almost butterscotch, flavor that so typically lifts Burgundy’s grand cru whites to otherworldliness. A distinctive note of vanilla emerges from carefully gauged time in oak, and a crisp acid frame lends the wine a vitality that will not soon wane in the cellar. Like all grand cru whites from the Côte de Beaune, this Corton-Charlemagne will only gain in splendor as it matures in bottle. But what a treat it is now – a patrician wine, and one to ennoble any meal susceptible to embellishment by Chardonnay.